MARS is the fourth planet from the Sun, whose name in mythology was as the Roman god of war or as Ares by the Ancient Greeks. Legend says he continually lusts for battle and war, who holds in his hands a large metal shield, shaped and forged conveniently from a fallen iron meteorite during its fiery descent to Earth. Mars is commonly referred as the “Red Planet” even though the naked-eye ruddy colour is more akin to orange or orangery-red. Much smaller than the Earth, Mars is 6,794 km across compared to 12,700 km. (53%), and is only 11% by mass. Its orbit averages some 1.52 AU or 228 million kilometres (km) from the Sun, but appears highly eccentric — varying between perapsis being 206.6 million kilometres and apsis 249.2 million km. 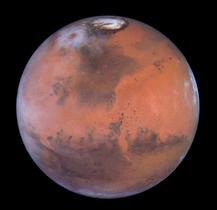 At various different oppositions, Mars can be as close to Earth as 54.5 million km. or at conjunction, be as far away as 401.3 million km. Combining the Earth’s 365.25 day year with the 686.98 days orbital period of Mars, means that successive oppositions occur once every 780 days or so — two years and two months. This causes both favourable and unfavourable apparitions, affecting the apparent size and general telescopic appearance. Mars may brighten to −2.8 magnitude at opposition — brighter than the star, Sirius or Jupiter — where it displays an apparent disk as large as 25.7 arc seconds. Water (H2O) : 210 ppm. Nitrogen Oxide (NO) : 100 ppm. Favourable close perihelia or perihelic oppositions are either fifteen or seventeen years apart. During unfavourable aphesis or aphetic oppositions, the planet shrinks to the apparent maximum size of 10.1 arcsec and only brightens to −0.8 magnitude. The last most anticipated opposition occurred on 27th August 2003 when it had one of its closest approaches to Earth at the distance of 0.372 AU or 55.6 million kilometres. Another closer opposition like this one will not again occur until 9th September 2729 AD. During the most distant conjunctions, when nearest the Sun, the size may decrease below 3.5 arcsec and may fall below +4.5 magnitude. Except near opposition, and about two months either side of it, Mars appears quite disappointing even in the largest of telescopes. We usually can see many faint features of various colours that changes significantly as the planet rotates over several hours. These match well to known features on the planetary surface. Some greens and blues colours are often prominent but are optical illusions formed by contrast effects between the various large Martian features. Careful observation proves these are cyclical — proving the rotation period some 37 minutes longer than Earth’s twenty-four hour period. The Martian disk also displays snow-white polar caps. These appear quite prominent because of the significant contrast and the 25° tilt of Mars’ axis. Similar to Earth, Mars rotates once every 24 hours 37 minutes with the planetary axis being tilted by 25° 10′ to the ecliptic. Like Earth, Mars has regular seasons, often shown by the polar caps that slowly enlarge then decrease as the Martian year progresses. Polar caps are composed of a frozen mixture of water and dry ice (CO2), whose atmospheric pressure is only one-hundredth that of Earth’s. Composition of the atmosphere comprises about 95% carbon dioxide, nitrogen, argon, with traces of oxygen and carbon monoxide. Midday equatorial temperatures may reach −15°C on the equator, but the average is more like −50°C. At nighttime this can descend as low as −110°C. We often see when Mars is closest to the Sun, the creation of planet-wide dust storms with high wind velocities of 24±6 metre per second. These can ravage the surface for weeks or even months, and obscure the planetary surface from view. The prominent rusty red colour of Mars consists of super-oxygenated iron oxide (Fe2 O4), which has been ground by erosion into a very fine powder. Mars also shows signs of early geological activity, such as many volcanoes, canyons and fault-line surface cracks. There are even clear signs that this may still be happening. Five significant very large volcanoes appear to be in an extensive line. Biggest of these is the 300 kilometre wide, Olympus Mons, whose monter cauldron is 64 km at its widest, and has its summit towering above the plain by some 24 kilometres — dwarfing Earth’ tallest, Mount Everest. Another gigantic geological feature is the Valles Marineris — a large canyon some 6 kilometres deep and more than 5,000 km long. Evidence also points towards the existence of water in the distant past, as the Martian surface shows ravines, river beds and flat pans. It is possible, that several billion years ago that the planet was once very much like Earth that included seas or oceans. In time, this water has either escaped into space or has become buried and frozen deep under the Martian soil. Presently there is real evidence for both these possibilities to be true. Many spacecraft have ventured to Mars. First was Mariner 4 in 1962 that found the surface of the Red Planet littered with craters. Since then, an armada of subsequent spacecraft, including orbiters, landers and rovers has followed this mission almost every two years. For sometime in the 1960s and 1970 there was a space race between the United States of America an the Soviet Union. Two of the latest missions have proved very successful and have yielded an enormous amount of data and images. From orbit has been the Mars Orbiter. On the surface has been the robotic rovers of Spirit and Opportunity. These two rovers have survived well past their projected life, but continue to run at the current time of writing (September 2007). In the coming decades, even more sophisticated spacecraft will visit Mars — and eventually all some dedicated manned mission in the not too distant future. Known conditions on the surface of Mars are certainly very inhospitable, with prospects of existing life being probably slim. This assumption relies on various criteria like; the extreme low temperatures, strong ultraviolet radiation from the sun, lack of protective ozone and the arid environment — but strong speculation that the planet may harbour some form of life continues. This generally popular concept really was born with the astronomer Percival Lowell in the 1890’s, who believed that he could see many ‘canals’ criss-crossing the surface of the planet. He had immediately assumed this was the direct evidence of some ancient civilisation suffering on a dying planet from thirst. For seventy-odd years his views have ignited the imaginations of people of the world. The wildest of these fantasies perhaps reached its pinnacle with the panic delivered by the famous Orson Welles’ whose night broadcast in 30th October 1938 dramatised the book “The War of the Worlds.” Originally written by H.G. Wells in 1898, this science fiction novel held many new concepts that were derived from the observations of Giovanni Schiaparelli (1835-1910), who described various lines across Mars as ‘canali’, which in Italian means literally open channels. Others then interpreted this to mean ‘canals’, and from this the story was stretched, where it became popularly believed that this was evidence of some alien race. This was stated as proof of an ancient and old civilisation, and fancifully assuming it to be probably dying, and were directing water from the poles to the warmer equatorial regions of the planet to grow their crops. Yet it is only in recent times that we can begin to prove or disprove the reality of Martian life. The first scientific expedition to establish this was in June 1976, with the two American Viking landers visited Mars. There aim was to take surface samples for analysis, and observe any changes in the material for signs of biological metabolism. No evidence for life was actually found, but this result in not finally conclusive, as the fixed landers may have been placed just in the wrong location. We may have also done the wrong test, as it is assumed that such life would be carbon based like life on Earth. If life does really exist on Mars, it would have to be very hardy and would be likely either bacteria or simple organisms. Another possibility is that microbial life once existed in the early Mars history, but has since perished. Today Mars is likely a dead world. “[Astronomers] have likewise discovered two lesser stars, or satellites, which revolve about Mars; whereof the innermost is distant from the centre of the primary planet exactly three of his diameters, and the outermost, five; the former revolves in the space of ten hours, and the latter in twenty-one and a half; so that the squares of their periodical times are very near in the same proportion with the cubes of their distance from the centre of Mars; which evidently shows them to be governed by the same law of gravitation that influences the other heavenly bodies. * Note: The distances of the orbits Phobos and Deimos are about two-thirds longer than this. Both moons are very close to the planet in near circular orbits, orbiting at the mean distance from the core of Mars is 9,378 kilometres for Phobos and 23,460 kilometres for Deimos. This places Phobos merely 6,000 over the Martian red terrain, and 20,000 km. for Deimos. Phobos orbits Mars rapidly in only 0.31891 days (07h 39m 13.8s), while Deimos orbits in the longer period of 1.26244 days (01d 06h 17m 55s). From Earth the apparent magnitude during opposition reach 11.8 and 12.9, respectively, however, they still require moderately large telescopes to see them against the overwhelming brightness of Mars itself. Observations can only be made when the moons are at maximum east or west elongation, and this would require an ephemeris for these specific times. Visually seeing the transits and occultations are nearly impossible, due to their relative small sizes. If an astronaut was on the surface of Mars and close to the Martian equator to the mid-latitudes, they would be able to see both moons move rapidly across the sky. At high latitudes both moons can never seen as they remain permanently below the horizon. Phobos to the naked eye would be very bright at −7 to −9 magnitude whose phases could only be seen with the naked-eye even in daylight. As Phobos orbits the planet just over three times per Martian day, the moon would be seen to rise and set from any given location seven times. Phobos could also be seen sometimes transiting across the Sun, whose observation would be dependant on the location on the surface of Mars and the time of year. These events are not very regular, as the orbital inclination is 1.1° to the Martian eliptic. If observed under good conditions Phobos would appear as large irregular shape covering the solar disk. However, the whose duration would last merely seconds. Orbiting satellites around Mars have observed and imaged from space, like the dark umbra of Phobos umbra crossing over the Martian surface. While the Opportunity rover has frequently observed a transit from the surface. Deimos one the other hand would not show its physical form or phases as the apparent size is roughly 2 arcmin — requiring optical aid to see. It would only appear stellar at −3 to −5 magnitude — similar in brightness to Venus in the Earth skies. A solar transit by Opportunity in March 2004 has been observed from the surface of Mars, followed two weeks later by the other rover, Spirit. Both Phobos and Demos are irregularly dark shaped objects some tens of kilometres in size. Phobos is the largest of the two whose rough potato shape measures 27×21.6×18.8 km. Deimos is much about half the size of Phobos. Its size is irregular and much less rounded than Phobos, being 15×12×10.4 kilometres across and is approximately one-seventh the mass. The physical appearance of these dark moons seems rocky, but the calculated lower density suggest they have lighter icy-like materials below the surface. Deimos has also been shown to be partial composed of carbonaceous material similar to geology of C-type asteroids. Phobos in its own orbit is predicted to end the moon is several tens of millions of years from now as the orbit continues to decay. Astronomers have speculate that its end might not be by crashing into the planet. Instead Phobos will finish as a ring around Mars caused by gravity tearing apart the body within the so-called Roche Limit. In the future we expect many unmanned spacecraft to journey to Mars, even expecting it to provide sample the surface and return it to the Earth for chemical analysis.